Want to try the best steak you've ever had? 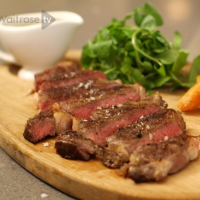 Follow Heston's simple steps to make perfect steak every time. 1. 24 hours before cooking, put the steaks on a cooling rack on a tray and put in the bottom shelf of the fridge, away from other food. 2. Take the steak out of the fridge half an hour before cooking. 3. Heat a pan until very hot, add the oil and cook the steaks until done to your liking, flipping every 15 to 20 seconds. 4. Place the steaks on a clean cooling rack on top of a tray and allow to rest for 5 minutes. 5. Season to taste and serve with Heston from Waitrose Beef Jus, triple cooked chips and watercress salad. Click here to see Heston's Steak and triple cooked chips. Click here to see this recipe being made. This recipe was first published in Tue Feb 10 15:52:06 GMT 2015.